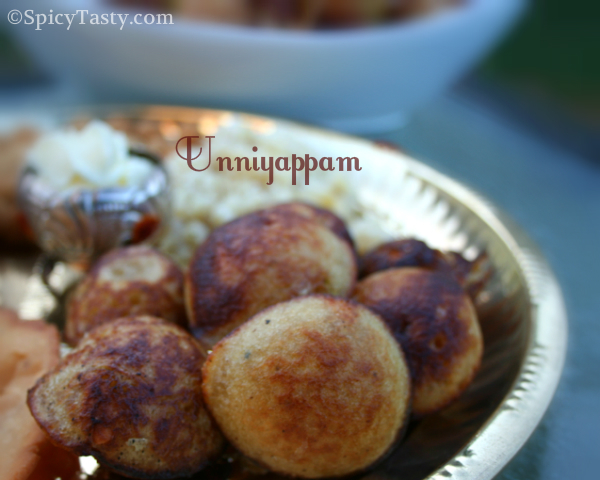 Unniyappam is a famous festival snack in Kerala which is made for all special occasions. 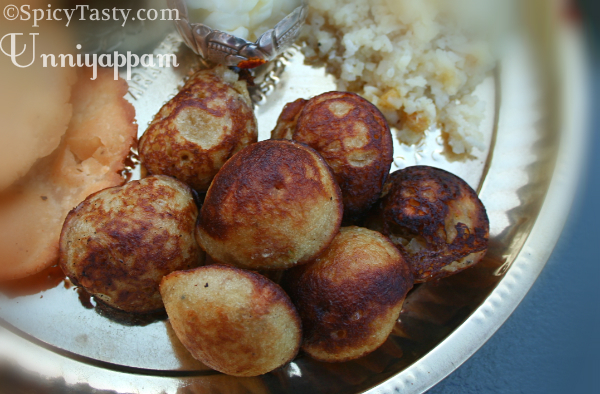 I made this Unniyappam for Krishna Jayanthi and I am planning to make this for Onam too. I got this recipe from my sis-in-law and I just loved it :). Soak the raw rice for 2 to 3 hours. Grind it smoothly without adding water. Add the Jaggery and grind it. Finally add the banana and grind it smoothly. Add 3 tbsp of wheat flour, cardamom powder, baking soda and sugar and mix well without any lumps. In 2 tsp of ghee fry the cashews and mix well. The batter consistency should little thin than Kuzhi Paniyaram batter. Heat the Kuzhi paniyaram pan and heat it in medium flame. Add very little ghee in each hole and add the batter in each hole. Cover it with a lid for 2 minutes. After you remove the lid, turn the unniyappam to the other side. When both sides turn golden brown, remove them from the heat. Adding sugar is optional. We can increase the jaggery amount by 2 tbsp if needed. Adding baking soda is also optional. I did not add the baking soda. We have to cook the Unniyappams in medium heat. We can use rice flour instead of raw rice and and we can deep fry instead of making in the Paniyaram pan. It’s that first bite and burst of flavor!